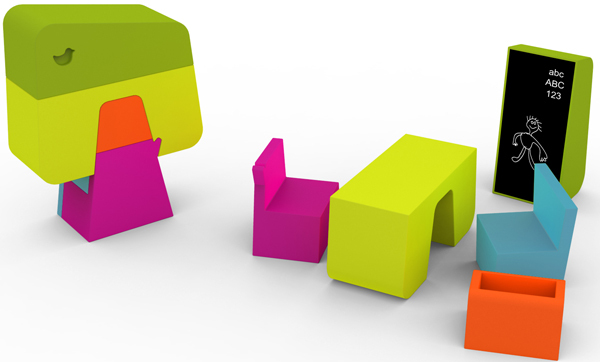 Sotano Studio - kids' foam furniture to inspire imaginative play! 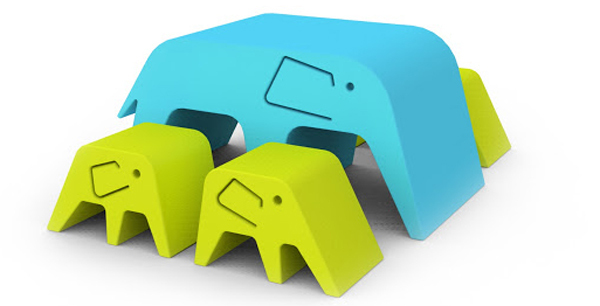 Sotano Studio – kids’ foam furniture to inspire imaginative play! Kids’ furniture that is both fun and functional? You bet! Sotano Studio have been busily working on amazing new designs for furniture made from durable coated foam – which we’re sure you will agree is a fantastic choice for children due to its soft and easy to clean nature. Teaming up with the clever crew at Foam Tek, three sublime designs are available that will most definitely pack a colourful punch of wow to a child’s space. Prepare to be dazzled by these awesome designs – they fit together jigsaw style and pull apart to become functional pint-sized furniture ready for oodles of childish fun. Three designs have been created – My Tree (pictured top) pulls apart to reveal pieces that become a desk, two chairs, a fun blackboard and a small trunk for toys and treasures. The Puppy becomes the best imaginary pet dog you’ll ever find and doubles as a bench for the drawing desk. Big Mama the elephant is perhaps my favourite, with her beautiful babies nestled under her belly – they pop out to become a fantastic table and chair set. For more information on colours and pricing, head on over to Foamtek, which offers worldwide shipping.